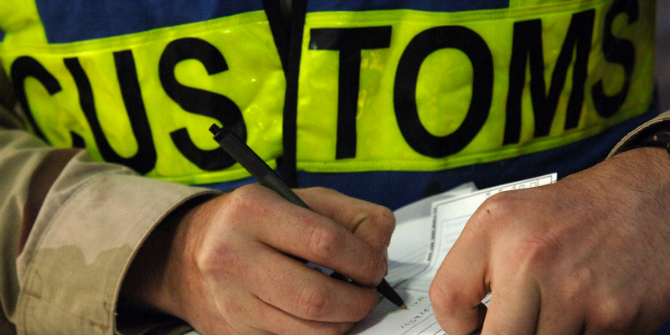 In a customs union, goods cross borders seamlessly, but in a free trade agreement, border checks are needed to ensure conformity with rules of origin. Paola Conconi explains why a customs union is key for multinationals wishing to stay in the UK after Brexit. Some members of Theresa May’s cabinet are pushing for a ‘soft’ Brexit, which would allow the UK to remain close to the European Union’s (EU) single market and customs union. Others favour a ‘hard’ Brexit and aim to strike a trade deal similar to CETA, the ‘comprehensive economic and trade agreement’ concluded between the EU and Canada. Multinational corporations with plants in the UK favour a soft Brexit. In a leaked report, the Japanese government points out that 879 Japanese companies, including manufacturing giant Hitachi and carmakers Honda, Nissan and Toyota, employ 142,000 staff in the UK. It calls on the prime minister to keep the UK in the EU single market and customs union, warning that Japanese companies may otherwise relocate to continental Europe. On 8 February 2018, Mrs May met Koji Tsuruoka, Japan’s ambassador to the UK, and representatives of major Japanese companies including carmakers, other manufacturers and banks. Speaking after the meeting, the Japanese ambassador reiterated the warning that his country’s firms will leave the UK if Brexit makes it ‘unprofitable’ to stay, saying ‘If there is no profitability of continuing operations in the UK, not Japanese only, no private company can continue operations’. Multinational companies like Honda and Nissan have long used the UK as their base to serve the European market. For example, almost 80% of the cars manufactured by Nissan in its plant in Sunderland are currently sold to consumers in the rest of Europe. EU membership guarantees regulatory alignment with the rest of Europe and duty-free treatment. Exit from the single market would imply that UK and EU regulations are no longer automatically aligned. More importantly, exit from the customs union would mean that multinationals may face high tariffs if they want to serve EU customers from the UK. This may seem surprising given that in free trade agreements like CETA, tariffs on most manufacturing products are slashed to zero. The key difference is that within a customs union, goods cross borders without any checks at all. By contrast, in a free trade agreement, shipments need to be checked by customs authorities to ensure that they conform with ‘rules of origin’ – criteria on the minimum domestic content in a given product. Only goods that comply with these rules are considered as originating from member countries and are granted preferential tariff treatment. Satisfying origin criteria is straightforward for simple goods like iron ore but is much more complicated for goods like cars, which are produced in international value chains using components from around the world. In our recent study, we show that rules of origin in free trade agreements distort global value chains, deterring final goods producers from importing inputs from non-member countries. We construct a unique dataset of the rules of origin contained in the North American Free Trade Agreement (NAFTA), the world’s largest free trade agreement: for every final good, we can trace all the inputs that are subject to rules of origin requirements; similarly, we can link every intermediate good to the final goods that impose rules of origin restrictions on its sourcing. Exploiting cross-product and cross-country variation in treatment over time, we show that NAFTA rules of origin led to a sizeable reduction in imports of intermediate goods from third countries relative to NAFTA partners. In terms of magnitude, our estimates imply that imports of affected intermediate goods from non-NAFTA countries would have been around 45% higher in the absence of rules of origin. Our study helps to explain why Japanese multinationals may pull out of the UK in the event of a hard Brexit. Companies like Honda and Nissan rely on global supply chains. For example, key components for the models they produce in the UK are imported from Japan. Right now, they can automatically sell the cars they produce in the UK to the rest of the EU at zero tariffs. But in the event of a UK-EU free trade agreement, they would face a trade-off if they decide to remain in the UK: stop importing key components from Japan and other nonmember countries to comply with rules of origin and obtain duty-free treatment; or keep their global value chains in place, but face a 10% tariff when exporting their cars from the UK to the EU. Relocating to continental Europe would allow them to remain in the customs union, avoiding this trade-off. Leaving the customs union would thus be more problematic than envisaged by both voters and politicians at the time of the Brexit vote. It would not only raise the possibility of a hard border between Northern Ireland and the Republic of Ireland, endangering the reconciliation process between them; but it may also lead multinationals to move out of the UK, resulting in the loss of thousands of jobs. If the government decides to go for hard Brexit, it should make sure that the rules of origin it negotiates with the EU as part of the new trade deal are as flexible as possible, to minimise the distortion of global supply chains and the risk of relocation of multinationals. The devil is in the detail: what threshold of minimum domestic content is agreed on cars may, for example, determine whether companies like Honda and Nissan remain in the UK or move to France or Germany. Note: This article draws on ‘From Final Goods to Inputs: The Protectionist Effect of Rules of Origin’ by Paola Conconi, Manuel GarcíaSantana, Laura Puccio and Roberto Venturini, CEP Discussion Paper No. 1525 and forthcoming in the American Economic Review. It appeared originally at our sister site, LSE Brexit. The article gives the views of the author, not the position of EUROPP – European Politics and Policy or the London School of Economics. Paola Conconi is Professor of Economics at the Université libre de Bruxelles (ULB) and Visiting Professor at CEP’s trade programme.